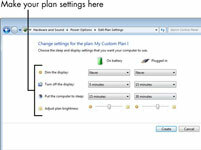 Windows 7 power plans can be customized to control precisely when the display dims or turns off, or the computer goes to sleep after a period of inactivity. By customizing a Windows 7 power plan, you can manage the battery life of your laptop without inconveniencing you or the way you like to work. If you don’t want to use a complete power plan, you can set some options separately, such as how much time lapses before your laptop automatically goes to sleep, and what happens when you press the laptop’s power button or close the lid. 1Choose Start→Control Panel→Hardware and Sound→Power Options. The Power Options window appears. 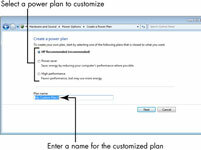 2Click the Create A Power Plan link on the left side. 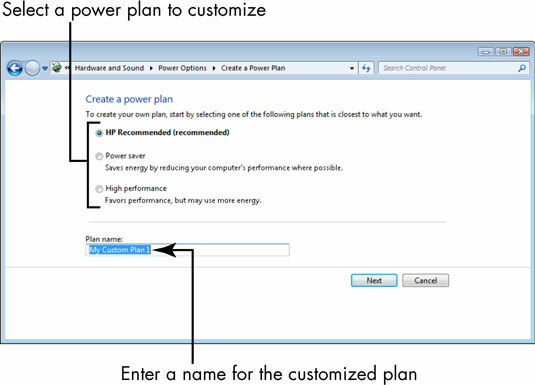 The Create A Power Plan window appears. You should choose a preset plan that is closest to what you want to create, so when you customize it, you’ll have fewer changes to make. 4Enter a name for the plan in the Plan Name text box and click Next. The Edit Plan Settings window appears. 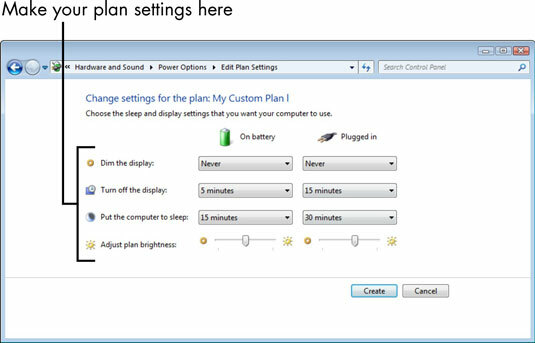 5Choose settings for how the laptop power functions when plugged in or running off the battery and click Create. You can set how long it takes after a period of inactivity for the laptop to dim its display, turn off its display, or go to sleep when the laptop is running on its battery or plugged in. You can also adjust how bright the screen is by default. A dimmer screen can save power. After you click Create, Windows returns you to the Power Options window with your new plan added to the list of power plans. If you choose to run your laptop with the power cord plugged in, your laptop could get warm to the touch, even though it has an internal fan. Consider unplugging your laptop occasionally to run off of battery power, or buying a laptop cooler, a pad with a fan inside that dispels heat when you rest your laptop on it.